Meet Brandon the Bumblebee!! Now I do NOT typically like insects at all! In fact, insects are one of my main stressers in the summer. 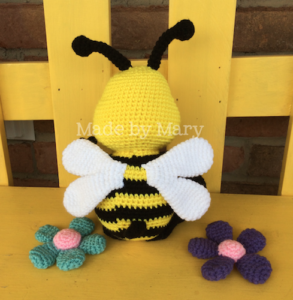 But this fun little guy is about 9″ tall sitting and a fantastic and cuddly little guy! He’s the perfect size for a hug! 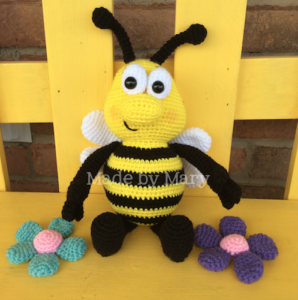 Now through April 7, get Brandon the Bumblebee 30% off in my Ravelry shop, no coupon code is required! Just add him to your cart and the discount will automatically apply at checkout. Brandon is the first in a series of insects! 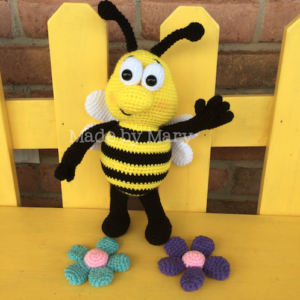 He is a fun spring or summer toy or decoration! Watch for more fun buddies of his coming your way!